Comments: Launched on 27th April 1985, Marve Super Heroes Secret Wars was a fortnightly Marvel UK title reprinting Marvel USA's Secret Wars as its lead feature; its title changed to simply Secret Wars with issue 10. Early back-up strips included reprints of Alpha Flight and the first Iceman mini-series, alongside humour strip Marvel's Secret Artist, but with issue #19 a new strip, Zoids, was introduced, and as of issue 20 the cover title changed to Secret Wars featuring Zoids for issues #20-26, after which the Zoids strip transferred to new title Spiderman and Zoids. 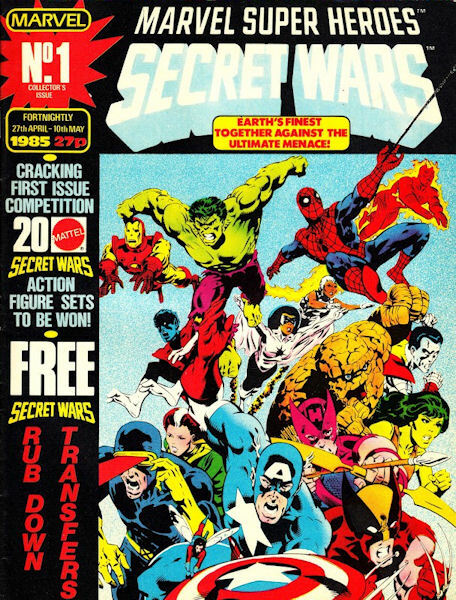 In issue #25 a new Spider-Man strip written by Jim Shooter exclusively for the UK was featured, and as of issue #32 the title changed to Secret Wars II as the title began reprinting that series and its tie-ins, often with modifications to fit the reprints to their new home or remove extraneous details (such as cutting out the references to Wraithworld appearing above Earth in the reprint of Fantastic Four #277, which was a link to the storyline then taking place in Rom). The series ended with issue #80, and a week later Spider-Man and Zoids began a five-part epilogue to the series, starting with its issue #46.